Most adults would change at least one big decision related to their college education if they could, related to their major (36 percent), what institution they attended (28 percent) or what type of degree they pursued (12 percent). This finding came from interviews with almost 90,000 U.S. adults conducted as part of an "Education Consumer Pulse" survey run between June 2016 and March 2017 by Gallup and Strada Education Network. 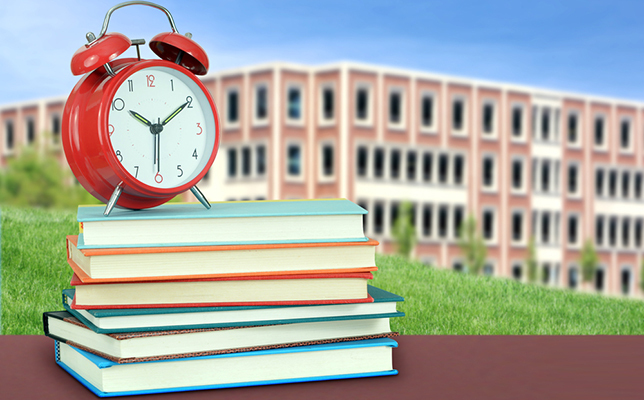 Strada, previously USA Funds, is a nonprofit focused on student success in higher education. The Education Consumer Pulse is a new research platform developed by the two organizations to research "education consumers." 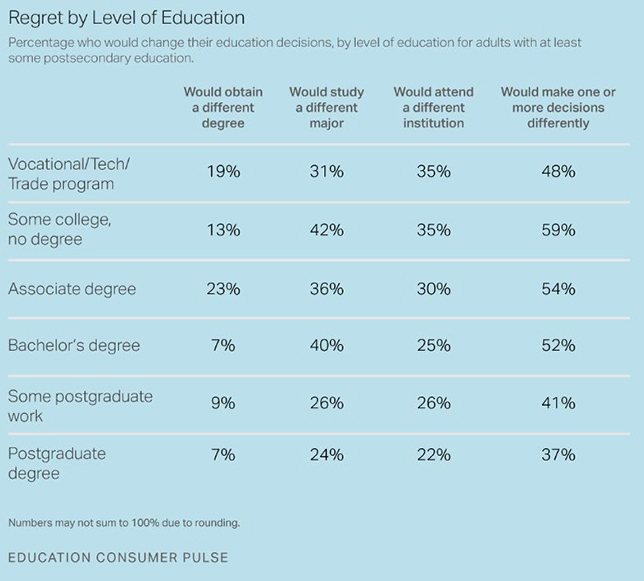 Those with some college but no degree were most likely to regret their original majors; 42 percent said they had second thoughts about that aspect of their postsecondary education. In fact, this group overall was more likely to regret at least one decision regarding college than any other group. In contrast, those who had some postgraduate work or a postgraduate degree were least likely to express regret over their choice of majors (26 percent and 24 percent, respectively). Respondents who attended a vocational, technology or trade program were more likely to say that they would have attended a different school (35 percent) than that they would have gone after a different major (31 percent). While most people expressed regret of some kind, most (with one exception) also believed they received a "high-quality education." The exception were those individuals who had some college but no degree. In their case, only 40 percent reported that they had received a high-quality education, compared to 58 percent of those who had achieved their bachelor's degree and 71 percent of those who earned a postgraduate degree. Gallup's pollsters suggested that the yearning for a different outcome expressed by most respondents was "rooted" in the challenge people face in "using their education to obtain their preferred job, such as when their field of study does not directly align with their desired career." It could also, they added, be a result of how the employment market has evolved since these individuals obtained their degrees. But the overall positive assessments respondents gave to their college experiences also seem to reflect, according to the researchers, a belief that postsecondary education and training has benefit and that schools are "largely delivering" on student expectations. The full results are available on the Gallup & Strada Education Network website here.